Gold Trader focuses on capturing the strongest and weakest parts of gold's daily cycle, buying daily cycle lows, selling daily cycle highs and holding for 10-20 trading days, depending on the cycle count. This approach allows me to effectively manage risk. The strategy aims to capture +5%-6% profit per trade while risking 2%-3% each time and has a win rate in excess of 70%. The stock market continues to climb higher on record low volatility. If this trend continues, European stocks will break out above 17 year resistance levels to new all time highs. If this breakout occurs (and holds), the Active Asset Allocator will take a position in European shares. The risk will be modest. Above 400-415 on the Eurostoxx 600 Index and I am a buyer. A meaningful close back below 400 and I will close or significantly reduce the position. I will let the charts be my guide. 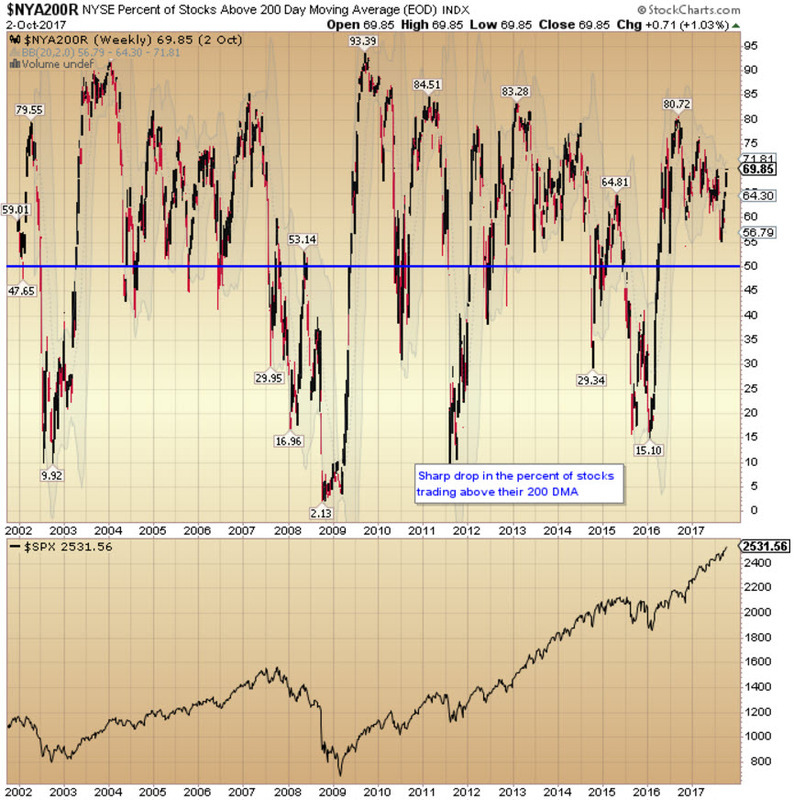 Apart from valuation concerns, stocks continue to exhibit bullish characteristics. I have pointed out a few areas of concern in recent Investor Letters, including a decline in the number of stocks making new highs versus new lows and have highlighted another area of potential weakness/divergence in this month's investment update. It is worthy of continued observation in the months ahead. 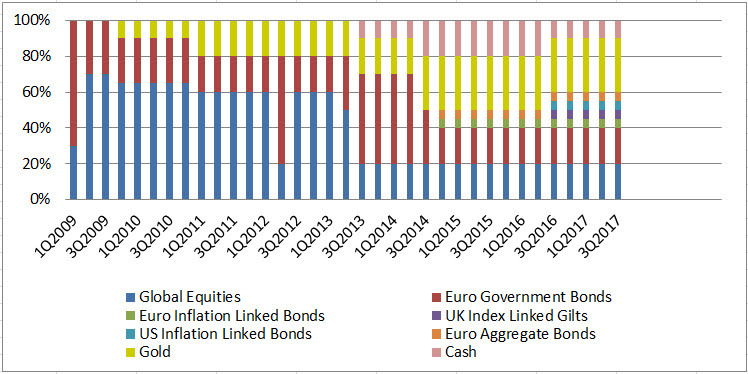 For now, Active Asset Allocator maintains an allocation of 20% global equities / 20% EU government bonds / 15% inflation linked bonds / 5% EU aggregate bonds / 30% precious metals / 10% cash. Turning to precious metals, Sprott Asset Management has agreed to acquire the common shares of Central Fund of Canada Limited (CFCL) and the rights to administer and manage CFCL’s assets. Upon completion of the transaction, all CFCL Class A shares will be exchanged for units in a new Sprott Physical Gold and Silver Trust. US$300 million in value is expected to be realized for CFCL class A shareholders, relative to 9% pre-announcement net asset value (“NAV”) discount. Good news for existing holders of Central Fund of Canada shares. The 7-9% discount has reduced to 2% and will be eliminated once the deal closes. Also please note, a Gold Trader performance update will follow shortly. Finally, for the history buffs amongst you, I posted an article in the Research section of the website entitled "The 1929 Parallel", written by John Kenneth Galbraith and published in the January 1987 issue of The Atlantic Magazine. The article is interesting both for its content and the timeliness of its publication in January 1987. Paul Singer, who runs one of the world's largest and most successful hedge funds, is certainly no fan of central bankers and the controlling influence they exert over financial markets, that's for sure...... and who could blame him. Since the start of 2016, the ECB has expanded its balance sheet by 57% or €1.55 trillion. They are adding another €250 billion in 2017. Not to be outdone, the Bank of Japan has expanded its balance sheet by 34% to $4.6 trillion. Notably however, the Federal Reserve has signaled its intention to start withdrawing liquidity from the banking system this month in a significant shift in policy away from Quantitative Easing (QE) to Quantitative Tightening (QT). They are starting slowly at a rate of $10 billion/month in October and increasing to $50 billion/month in 2018, market permitting. Despite Singer's reservations, stock markets around the world are climbing steadily higher. Money flows where it's treated best and so far, stocks continue to attract record inflows, particularly into passive, indexed tracking funds. This bull market has now become the second largest in history with the S&P 500 returning +275% since March 2009 in USD terms. Only the decade-long run of the 1990's has done better, +400%. US stocks now account for 52-55% of the global equity benchmark, depending on the benchmark you follow. The recent climb higher has come on record low volatility. 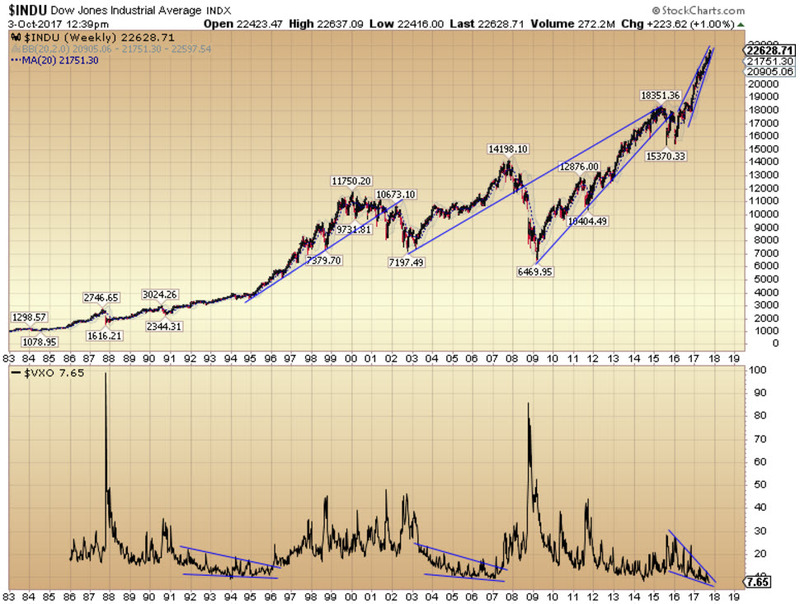 The next chart shows the Dow Jones Industrial Average. The volatility of the weekly price moves is captured in the lower half of the chart. If you look closely, you will see that volatility has reached a multi-decade low. A rise in volatility does not necessarily have to coincide with a collapse in stock prices (1996-2000 for example), but it could (2008-2009). In 2017 YTD, global equities have returned +3.7% in euro terms. Stock markets have navigated the historically volatile month of September with ease. If they continue to trade in bulletproof fashion in October, we may see a run higher into the end of the year. Apart from valuation concerns, stocks continue to exhibit bullish characteristics. I have pointed out a few areas of concern in recent Investor Letters, including a decline in the number of stocks making new highs versus new lows. I have also highlighted another area of potential weakness/divergence below. Here is a chart of the FTSE World Index, the global equity benchmark, priced in euro terms. The Index made a higher high in 2017 but on weaker relative strength (RSI) and falling momentum (MACD). This suggests the uptrend is weakening, which usually occurs towards the end of significant moves. It is worthy of continued observation in the months ahead. While stocks continue higher, a declining number are trading above their long-term 200-day moving average. 81% of stocks were above their long-term trend in late 2016. Today, just 70% are in confirmed uptrends. Below 50% and the stock market would get into difficulty. What if I'm wrong? What if stock markets melt up for two more years, or longer? 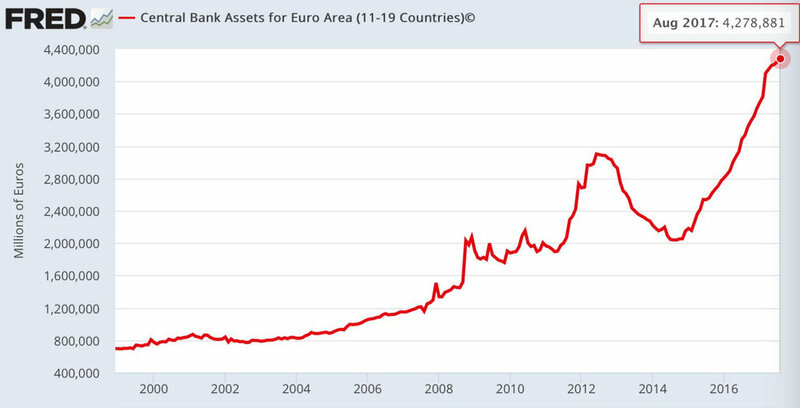 Central banks have already printed trillions and that money is sloshing around the system. What happens if money continues to flow into equities each month with no regard for valuation? I don't expect it will happen but it might. We are operating in unprecedented times. So here is my plan. European stocks in aggregate trade at a valuation discount to US companies. Many European stocks are household names (Siemens, SAP, Unilever, Total, Allianz, Anheuser Busch Inbev) yet are under-owned relative to their US counterparts. Eurozone stocks for example account for just 11% of the global equity index (17% if you include the UK), compared to 55% for the US. European stocks, as measured by the Eurostoxx 600 Index, have traded in very broad range for the last 17 years. The Eurostoxx 600 Index hit a resistance zone of 400 in 2000, 2007 and again in 2015, failing to break out on each occasion. We are approaching that resistance zone again today. The Index reached 390 this week. The market may be strong enough to break through this time. A confirmed break above a 17-year resistance zone would be significant, and quite bullish for EU stocks. If the Eurostoxx 600 Index can close at new all time highs and turn resistance into support, the Active Asset Allocator will take a position in European shares. The risk would be modest. Above 400-415 and I am a buyer. A meaningful close back below 400 and I would close or significantly reduce the position. I will let the charts be my guide. The revised asset mix would be: 10% global equities / 30% EU equities / 10% EU government bonds / 15% inflation linked bonds / 30% precious metals / 5% cash. One final comment. Passive fund flows are dominating the industry. Almost $500 billion flowed into passive funds in 2016 according to Morningstar, while $200 billion flowed out of active funds last year. That is almost three quarters of a trillion dollars... In one year! One of the unfortunate side effects of this trend has been that the industry is losing talented and thoughtful leaders in active management and none come more talented than Hugh Hendry, of Eclectica Asset Management. Hendry closed his Global Macro Fund last month after suffering a tough period of sub-par performance. His Fund returned -10% YTD through 31 August. Hendry was interviewed recently on the Adventures in Finance podcast. Well worth a listen. 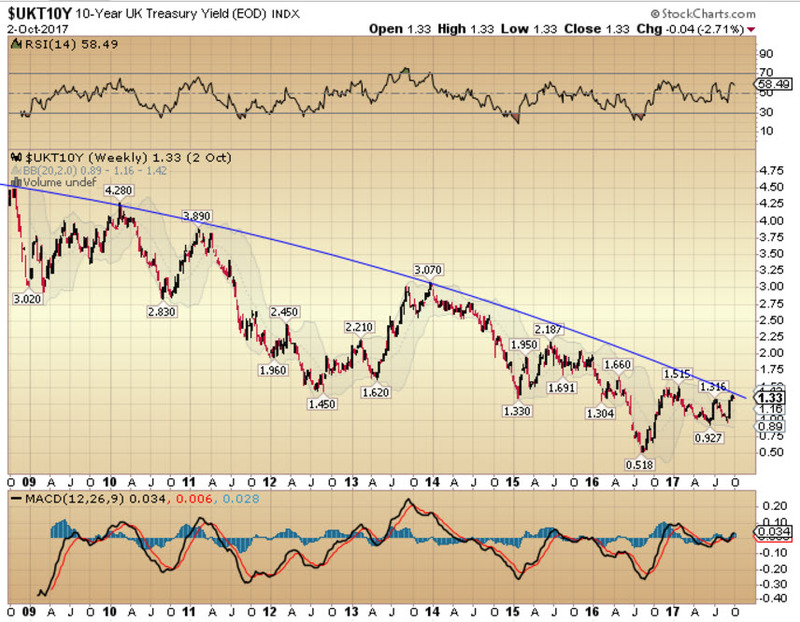 While 2 and 5 year UK and US bond yields have risen a little in recent months, 10 and 30 year bond yields remain firmly in downtrends across the world. 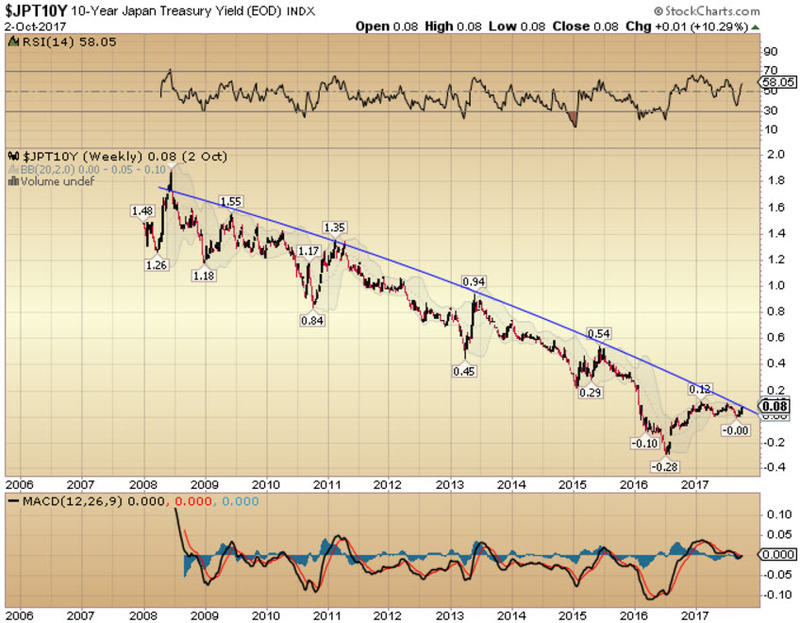 We could be getting close to a break out higher in longer-dated government bond yields in some regions, but not yet. 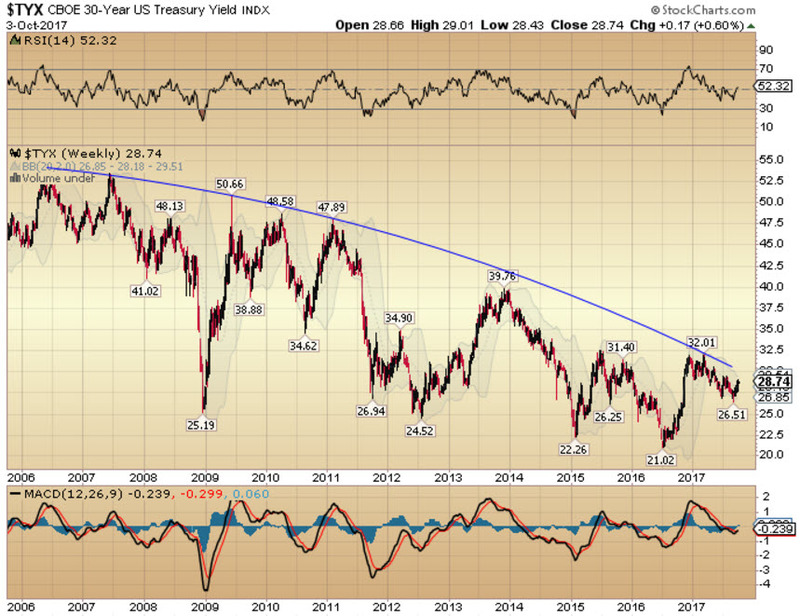 Inflation-linked bonds meanwhile remain in broad multi-year uptrends. UK and US IL bonds were adversely impacted in recent months due to currency movements, but the longer-term trends remain intact. The Active Asset Allocator may tilt the exposure towards inflation hedging via ILB's, precious metals and an increased EU equity allocation and away from deflationary hedges (cash and fixed interest rate bonds) if markets start pricing in a more inflationary bias. I do not see that happening quite yet, but the trend may be turning in that direction. As noted in a recent Market Alert, Sprott Asset Management agreed to acquire the common shares of Central Fund of Canada Limited (CFCL) and the rights to administer and manage CFCL’s assets for C$120 million in cash and stock. Upon completion of the transaction, all CFCL Class A shares will be exchanged for units in a new Sprott Physical Gold and Silver Trust. US$300 million in value is expected to be realized for CFCL class A shareholders, relative to 9% pre-announcement net asset value (“NAV”) discount. Good news for existing holders of Central Fund of Canada shares. The 7-9% discount has reduced to 2% today and will be eliminated once the deal closes. After a sharp -12% decline this year, the US dollar is attempting a long-overdue bounce. I am not expecting much of a rally, rather a consolidation around current levels before the next leg lower. US dollar trends typically last years once they get going. Following the Plaza Accord in 1985, the USD fell sharply and remained in a downtrend for 10 years. The USD Index then rallied from 1995-2001 before the next sharp decline from 2001-2008. Following a choppy move higher from 2008-2016, the USD Index has reversed sharply lower in the first nine months of 2017. I believe this is the start of a multi-year trend lower. Gold is waking up to the USD reversal. From 2001-2008, the USD Index fell -43% from 126.21 to 71.33. During that period, Gold rallied over +600% from $250 to $1900. I think we could see something similar this time around. Gold has broken its multi-year downtrend and is now back-testing the prior resistance zone. 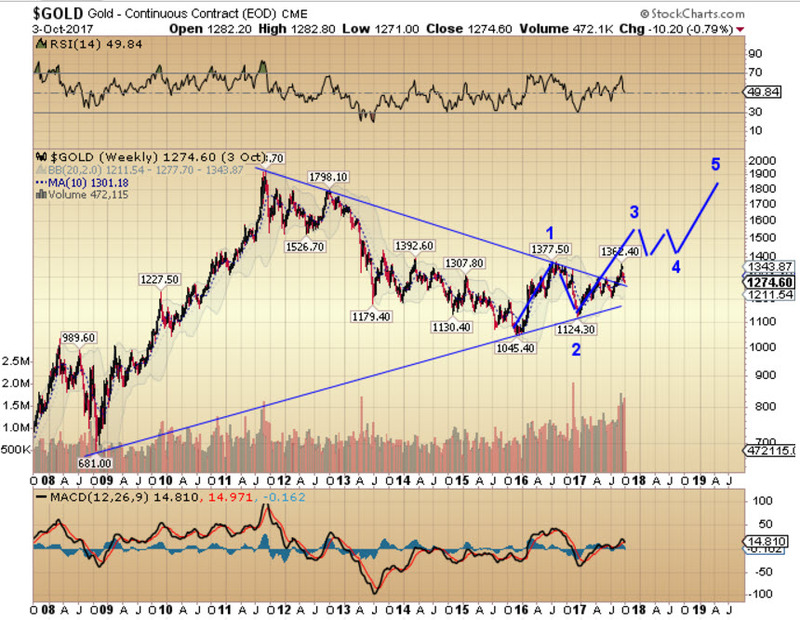 I expect resistance to become support as gold builds the energy to launch higher over the next 12 months.